The Competition and Markets Authority (CMA) is reviewing funeral costs, "to ensure that people are not getting a bad deal". Meanwhile, the Treasury is focusing on concerns over pre-paid funeral plans. Consumer groups have complained that people who pay for their funerals in advance could find their relatives face extra costs after they die. The Treasury is considering a move that would mean tougher regulation of pre-paid funerals and is opening a consultation process. The CMA said that because of the Treasury's separate action, it would not examine the pre-paid funerals sector. Instead, it will look into the cost of funerals in general. It wants to ensure that people have clear information on prices and services and get a fair deal on cremation fees. The average cost of a funeral in 2017 was nearly £3,800, the CMA said. 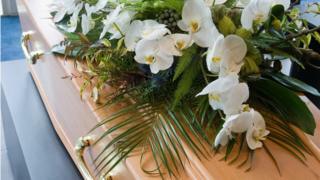 Many plans do not cover costs such as embalming, limousines, a funeral service, a wake, burial plots or memorial stones. In some cases, families are left having to find an extra £2,000, even though they expect such items to be included. Daniel Gordon, senior director of markets at the CMA, said: "People can understandably be very emotionally vulnerable when planning a funeral. "We therefore think it is important that - at what can be a particularly challenging time - the process is made as easy as possible." The CMA intends to publish an interim report in six months' time, with a final report coming six months after that. The Treasury is considering a suggestion from consumer group Fairer Finance that the Financial Conduct Authority should play a role in regulating pre-paid funeral plans. "This announcement is only the start of the process, but it sends a clear message to those companies who are not acting responsibly that now is the time to clean up or exit the market," said James Daley, managing director of Fairer Finance. "People who buy funeral plans are not around to measure delivery against their expectations, which is why it is so important there are clear rules around how companies must behave." At present, regulation largely comes under the Funeral Planning Authority (FPA), which has limited powers to punish abuses. The FPA said that it was confident the review would prove the effectiveness of its work. Regulation by others would lead to less choice, higher costs and "a less dedicated oversight of the market", it argued. "We continue to raise awareness among customers about how important it is to buy a funeral plan from an FPA registered provider. Only these providers will have undergone stringent checks and will be operating to an agreed set of standards, designed to protect the customer," it said. In April, one funeral services firm, Dignity, said more of its customers were opting for budget funerals, with a standard-issue coffin and no frills. But the company said "simple" funerals represented only 15% of its services, less than it had expected after it slashed prices earlier this year. In January, the firm announced it was cutting the cost of its "simple funeral" option from £2,700 to £1,995 in England and Wales (£1,695 in Scotland) in the face of increased competition. Dignity's head of insight, Simon Cox, welcomed the Treasury's consultation, saying: "It is excellent news that the government has decided to do something about mis-selling in the funeral plan sector. "Our research has shown that bad practices like persistent and pushy cold-calling are rife among firms that have no oversight from a regulatory body." However, Dignity's share price fell 14% following the Treasury and CMA announcements.